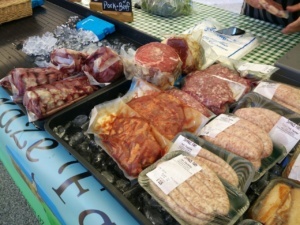 Our meat is sourced from our premium, pedigree animals, call and see our beautiful cattle and pedigree pigs. Our Highland matriarch conservation grazing above Portheras Cove at Chypraze. Ian and Mervyn took over grandmother’s farm, Chypraze, in 2009 realising that its former business as a small dairy farm was no longer viable. A new approach had to be developed. Ian’s lifelong activity in the Green movement led him to believe that there might be a role to play in meeting the concerns of people worried about the quality of their food, where it came from, how far it has had to travel, how animals were treated, whether they are dosed with anti-biotics, whether the land is dosed with chemicals and whether factory farming is in fact destroying the environment. Owner of the farm conservatory grazing Curiously the fact that the farm has had no investment in its buildings for 60 years means that what we found were the basic cows and pigs houses of a bygone era when all animals were outdoor grown and pasture fed. We had a start! We tried fast growing modern pigs but soon turned to traditional rare breeds noted for their taste – the Saddleback and Middle White and after several years of trial and error we think we are now producing meat that tastes like pork used to with ample crackling for those so inclined. 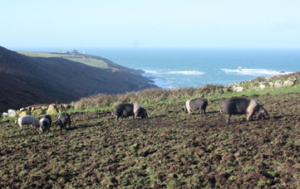 Currently 15 acres are dedicated to 100 pigs so they have loads of room to munch and play for the time they are with us, and they have the best views in the county! They are not crammed inside rearing houses and do not need routine dosing of anti-biotics because they do not carry MRSA. They get all the minerals and vitamins they need from devouring turf and we find this keeps them in tip top condition. We bring the sows inside to farrow in comfort in traditional pens with plenty of space and when the young are weaned they go out to the arks in the fields. The other string to our bow is our herd (fold) of Highland cows. With these we are working with Natural England to improve the diversity of the environment on our cliff fields. This native rare breed is ideal for the rather rough and steep terrain. The strategy is to reduce the density of gorse and to encourage other plants, shrubs, heathers and grasses so that the maritime lowland heathland can return and with it the unique fauna and flora including ground nesting birds - stonechat, whitethroat and lark, reptiles – lizards and slow worms and butterflies like the Grayling. The holy grail of our conservation efforts is the Cornish Chough. This is where the Highlands have a critical role to play – their dung provides the perfect home for the bugs that choughs must have to survive. After 5 years waiting we are excited to report that there now regular sightings of a small flock of choughs feeding on Chypraze. The result for our customers is tasty meat from cattle from a very low density herd that has been 100% pasture fed with no supplementary protein feed at all. Our neighbours are also undertaking conservation grazing and we take some of their produce to provide continuity of supply. As they too have to rear native rare breeds to comply with their stewardship agreements we are able to offer a range of unusual fare for our customers to sample. We will always say exactly what sort of animal we are selling. These include the rarest British breed – the Whitebred Shorthorn as well as Standard Shorthorns, Belted Galloways, Red Devons, and our own Herefords and Highlands. To complete the picture we have installed our own butchery at the farm and learned to process and pack the meat ready to deliver straight to our customers. We can’t compete on price with supermarkets but we hope to supply people who want to know what their food is and where it comes from. 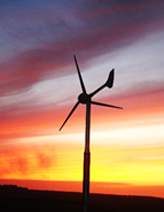 To improve our sustainability credentials and reduce our demand for fossil and nuclear fuels we have installed a 5KW Evance wind turbine, 4KW solar panels, a ground source heat pump to provide heating and hot water and we have internally dry lined the external granite wall of the farmhouse to include 30mm of foam insulation. Our run around and delivery vehicle is a fully electric Peugeot Ion that has its charge point connected to the renewable energy sources. Our next energy project is to extract some hydro-energy from the stream on Chypraze that used to power several water wheels and tin ore stamps. friendly methods, come to us at Chypraze Farm.